While Captain Janeway is usually considered to be the first female captain in Star Trek, I would argue that there was one who preceded her: Jeri Taylor. Although we never saw Jeri onscreen, her influence behind the scenes was more than enough to give her captain status in the Star Trek universe, and without her, we never would have had the Kathryn Janeway that we do. Born in Bloomington, Indiana in 1938, Taylor went to Indiana University and received a B.A. in English. Many of her scripts and other memorabilia from her work now reside in the Indiana University library. Before working on Star Trek, Jeri wrote for series such as Little House on the Prairie and The Incredible Hulk, as well as producing and directing on Quincy, M.E. (a show about a county coroner investigating seemingly innocuous deaths). She wrote the teleplay for the 1981 movie Please Don’t Hit Me Mom, a drama about a teenage babysitter who discovers her charge is being abused, and co-wrote A Place to Call Home, a TV movie made for CBS which follows a woman who, along with her husband and 11 children, moves to live on a sheep ranch in Australia. Jeri Taylor got her start in Star Trek as a screenwriter for The Next Generation when Lee Sheldon, a screenwriter on Quincy, M.E. recommended her to the producers of the show. Jeri was brought on as a screenwriter for TNG and quickly became a leading producer and showrunner for Voyager, before giving up her producing position to serve as a creative consultant on the series and write several Voyager novels. As she says in Journey’s End: Saga of Star Trek TNG, “I think I was hired on the show because of my ability to tap into the human condition and to dramatise stories about people’s inner feelings.” Romance, a topic which has often been more miss than hit on Star Trek, was something Taylor was much more willing to explore than the male writers. The later seasons of TNG include much more romance and interpersonal drama than the earlier seasons, a shift in tone that paved the way for the serialized dramatic structure of Deep Space 9. While this did lead to some missteps (most notably, in my opinion, Dr. Crusher’s brief relationship with her dead grandmother’s ghost boyfriend), it also lead to what is arguably the first healthy and realistically portrayed relationship in Star Trek: Tom and B’Elanna in Voyager. Actors consistently say in interviews that Jeri Taylor was the best at fleshing out characters, and they would often come to her if they had script concerns. Robert Beltran in particular recalled that during the years she was at the helm he felt more heard by the writers. Coming from a background of dramas and dialogue heavy procedurals, Jeri loved writing the dialogue and characters and hated the sci-fi elements. Like much of the cast, she would have been happier if the Star Trek universe had not been so full of technobabble. However, in a writers’ room where she was often the only woman, many of the interpersonal stories and character development seemed to fall to her, and she was able to weave them fairly well with the more technical plots. Speaking about “Final Mission,” the episode of TNG in which Wesley Crusher leaves the ship to attend the academy, Jeri recalled that “That’s the episode I probably put more work on than any all year long, because it was a combination of a very delicate kind of interpersonal story, and the dreaded technical story which is the garbage scow in space.” She admits that this kind of technical/person marriage is not one that she in particular or Star Trek in general always did well, noting that Deanna Troi in particular was the victim of several disastrous plot lines. Screencap from “Coda,” which was written by Jeri Taylor. This put Taylor in the perfect position to create the character that remains the most well known of her career: Captain Kathryn Janeway. She has said that “Janeway ranks right up there with all the Star Trek captains,” and, although fan opinions of the character are not always positive, that Janeway, “in terms of grit, intelligence, compassion and grace under pressure [is equal to any other captain].” The studio received death threats over the decision to cast a woman as captain. In this context, there was massive pressure, felt mostly by Taylor, to make Janeway so strong she was larger than life and above ridicule. 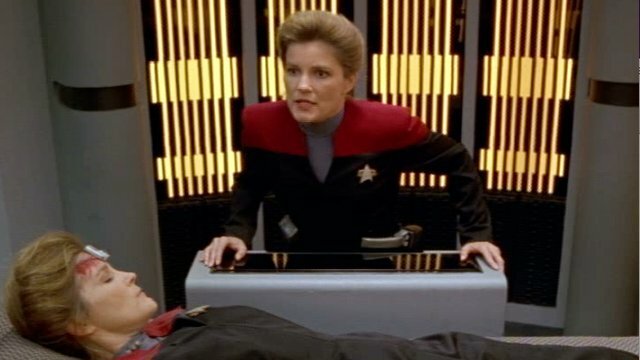 Everything from her hairstyle to her voice to the bra under her costume was overanalyzed to a ridiculous degree, and many agree that Janeway wound up somewhat stiff – a caricature of a woman in power that would become more natural only after Taylor left the show. Voyager is a testament to both the obstacles Jeri Taylor overcame to create the character, and the sexism that couldn’t be overcome at the time, that shaped how women were allowed to be portrayed onscreen, even in positions of power. Great post, so many good points. Love Jeri Taylor and what she contributed to Trek. I can see now why Janeway is from Indiana. Thanks for this great blog! I once pitched some stories to Jeri Taylor for Star Trek Voyager..and i would love to talk to her.. do you have a email or something that i could use ?